Ryanair’s first flight to Malta on the night of October 31, 2006. 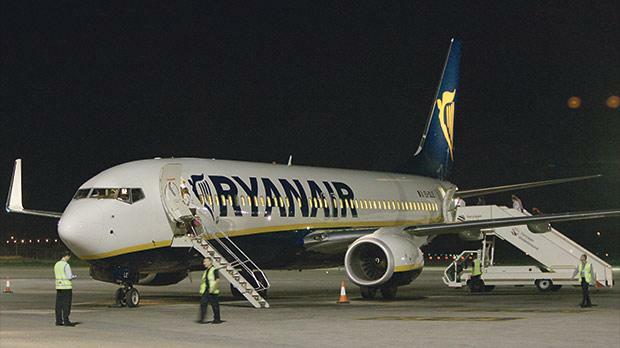 Ryanair planned to be Malta’s number one airline as from next year, chief commercial officer David O’Brien said yesterday while celebrating the low-cost carrier’s first decade on the islands. Having started with just two routes in 2006, Ryanair aims to carry over two million passengers next year, with 42 destinations and 140 flights a week. “We are now almost Malta’s national airline”, Mr O’Brien said sarcastically in the presence of Tourism Minister Edward Zammit Lewis, who is piloting the talks between Air Malta and Alitalia over the sale of shares. When asked whether Ryanair was still receiving subsidies through the government to open and develop new routes, he said: “I can’t reply to that question, as we do not recognise any subsidies. We pay money in Malta.” Neither would Dr Zammit Lewis give any details, insisting he could not say anything on the subject. It is open knowledge in the airline industry that Ryanair and other low-cost carriers receive public handouts for serving destinations or flying to airports not reached by legacy airlines. In Malta, such schemes are known as market development programmes and run into millions of euros every year. Mr O’Brien pointed out that Ryanair’s presence in Malta had led to a significant increase in the number of tourists visiting the island and helped Malta register unprecedented growth. He said that the Irish carrier had now decided to place a new aircraft in its Malta base as from next year, which will bring the total to four planes. In 2017, Ryanair will serve six new routes from Malta. Journalists waited in vain yesterday to speak to Tourism Minister Edward Zammit Lewis after the Ryanair anniversary event, though he did give a comment to Labour’s ONE TV in a different room. Journalists from the Times of Malta, MaltaToday and Net TV who wanted to ask him about the talks between Air Malta and Alitalia were informed by a Malta International Airport official that the minister had left. MaltaToday reported on-line that Ryanair chief commercial officer David O’Brien had also been waiting for the minister to cut the celebratory cake. During an activity at the Old University building in Valletta last month, Prime Minister Joseph Muscat also left, through an emergency exit, as journalists waited to speak to him.